If you need more reasons for you and your dog to do a happy dance – this grain-free & gluten-free dog food recipe is perfect for adult dogs and puppies! This dry dog food recipe is blended with just the right amount of extra protein to transform your dog – inside and out. Your dog will love feasting on this mouthwatering meal – chicken, tapioca, chia seed (rich in Omega-3), quinoa, prebiotics and probiotics to support digestion. Watch them bust a move and let their inner gold shine! Grain-Free & Gluten-Free, natrual & holistic dry dog food with added vitamin, minerals and amino acids for medium and large dogs all-life-stages. Made with high-quality, deboned chicken with tapioca as the primary starch. Chia seed, tumeric and quinoa for omegas . Crafted with Chicken, Quinoa, Sweet Potato, Chia Seed and other wholesome and nutritious ingredients. Ingredients: Chicken, Chicken Meal, Tapioca, Peas, Whitefish Meal, Canola Oil (Preserved with mixed Tocopherols), Tomato Pomace, Quinoa, Dried Eggs, Potatoes, Sweet Potato, Chia Seed, Natural Flavors, Flaxseed, Potassium Chloride, Salt, Choline Chloride, DL-Methionine, Salmon Oil (preserved with mixed Tocopherols), Taurine, Dried Chicory Root, L-Carnitine, Carrots, Pumpkin, Apples, Cranberries, Blueberries, Broccoli, Parsley, Spearmint, Almond Oil (preserved with mixed Tocopherols), Sesame Oil (preserved with mixed Tocopherols), Yucca Schidigera Extract, Dried Kelp, Thyme, Lentils, Vitamin A Supplement, Vitamin D3 Supplement, Vitamin E Supplement, Zinc Sulfate, Niacin, Ferrous Sulfate, L-Ascorbyl-2-Polyphosphate (Source of Vitamin C), Calcium Pantothenate, Thiamine Mononitrate, Copper Sulfate, Riboflavin, Pyridoxine Hydrochloride, Manganese Sulfate, Zinc Proteinate, Folic Acid, Calcium Iodate, Manganese Proteinate, Copper Proteinate, Sodium Selenite, Biotin, Vitamin B12 Supplement, Rosemary Extract, Dried Lactobacillus Acidophilus Fermentation Product, Dried Enterococcus Faecium Fermentation Product, Dried Lactobacillus Casei Fermentation Product. Con: It is a high end, high quality food, therefore it costs more. For the budget conscious, it may be difficult to take the leap to feed it full time. My suggestion would be to mix in with current kibble or rotate feeding. Review: The dogs loved the food and it was easy on their sensitive tummies. I was surprised that it didn’t cause digestive issues because all other chicken based foods, other than raw, have caused vomiting and/or diarrhea. They loved the taste, it’s easy to feed, store and LOVED the high quality, whole foods ingredients used. Thank you Solid Gold for providing pet parents with such great options. 2 Benefits: healthy food and according to her reaction delicious! Con: I can’t think of anything. 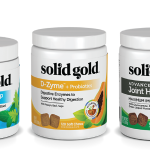 Review: All Solid Gold products are excellent, well worth the cost. I know I saved money on Vet bills. The new Sun Dancer is to me the best product so far. I definitely will use it on my next pet. Thank you for your excellent products. 2 Features: Good ingredients. Fun Packaging! 2 Benefits: Good ingredients = healthy pets! 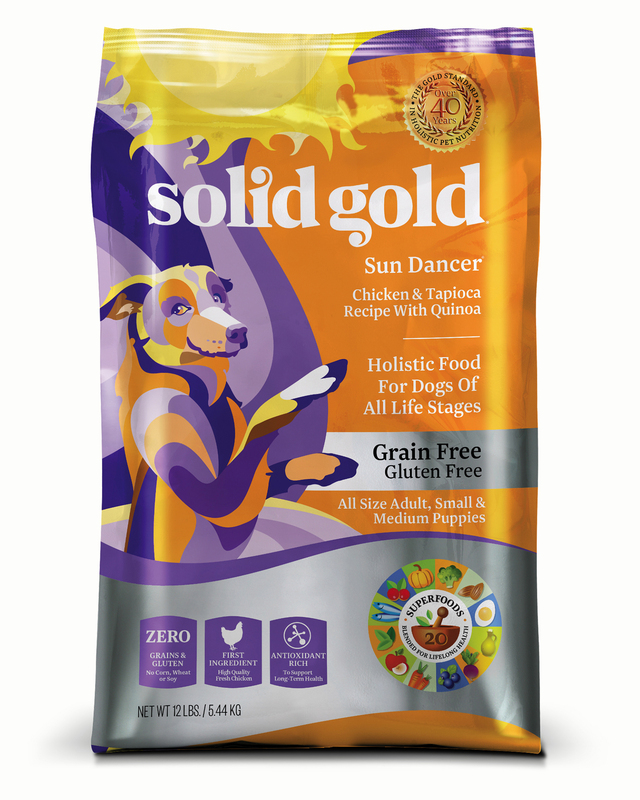 Review: Solid Gold products are ”a quality standard” and Sun Dancer falls in to the Solid Gold reputation of being a quality dog food. In addition, the packaging is not only fun with it’s sparkly exterior but there’s no folds on the inside at the bottom for the last bits of kibble to get lost in. Win! Win! Review: New favorite & no more hot spots! Within a week my dogs hot spots were gone! Very impressed with this food & its ingredients. Contains many ingredients that I was giving in supplements. We’re sold! Review: We have 2 dogs, Pippin and Dobby. Dobby loved the food but Pippin is a bit of a picky eater. We did have to supplement the Sun Dancer food with some other tasty treats/toppings to get him to eat. The dogs have always enjoyed Solid gold food. I’m not sure why Pippin was so picky. Review: I was glad we tried it out. Will definitely recommend for our adopters with sensitive stomachs for a more natural food than taking medications. I think would also be great for seniors: my smaller, older foster did great on this selection!! Con: Not sure of the price. Would possibly have to mix with my present kibble. Review: This is great food. Loved by all my dogs which 2 are typically very fussy. Tolerated well without diarrhea or vomiting. Con: Has potato in it, but far enough down the line of ingredients. I have a dog that gets yeasty sometimes and potato is noted to be an ingredient that causes yeast. Had no problem though. Review: My 4 beasts are all 40-100# and it was an easy transition to Sun Dancer. Coats look great, less farting:) They gobbled it right up. Will likely continue feeding this as main food. Review: My dogs loved this product. All the other dog food bags were envious. I foster dogs so food is provided for them but they all wanted the Solid Gold too!!! I noticed my 7 year old schnauzer had more energy and my parent’s dog who is a picky eater would try to steal his food when he would stay with them! Review: I have 4 corgis, they all loved the taste, even my picky boy. The coats are bright and shiny, weights remained good. One of my dogs can have gas issues on some foods, but she had no issues with the Sun Dancer. We will be adding this to our rotation. 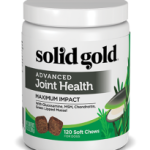 Review: We started using Solid Gold products in about 2000.We had a dog that was a cross between a chow and a golden..she had a friendly, happy disposition. When we first got her at the age of 4 mos. we gave her Science Diet and Eukanuba. After a couple of years of digestive problems the vet advised that to not give her any dog food that had copper sulfate as one of the main ingredients, that it was giving her problems. For the next 11 years we gave her Solid Gold Hund-n-Flocken and she lived until the age of 13. Beautiful coat and very healthy. We now have a 135 lb. Bernese Mountain Dog/Rottweiller mix that is 4 years old. We got her when she was 8 mos. old and she was on Solid Gold Wolf Cub and Hund-n- Flocken mixed together. She has been healthy and it makes her coat shiny. She graduated to Wolf King at about 15 months. She has a variety of allergies and this food has kept her in balance, healthy poops and wonderful nature. Con: It’s a bit on the higher side price-wise so I mix it with another premium food and the dogs love it. Review: Very happy with this product. Will continue to buy and use it for my pets. Review: I feel great giving my dog Sun Dancer– so many great ingredients like quinoa, sweet potato and pumpkin, and nothing that you don’t want in it! He is on a weight maintenance plan, so I like that this food is filling and has significant protein content. My dog even enjoys pieces of this food as treats! I have also noticed that my dog does not immediately need to drink water after eating this food, unlike other brands with dehydrating additives. 2 Features: I liked that it had 30% protein. It had a variety of vegetable meat, flaxseed, dried eggs, pumpkin and folic acid. 2 Benefits: loved the taste of this food, even my picky eaters who give me a very difficult time eating their current food. Con: I thought the larger pieces would be a problem because my pugs are used to small pieces. There was not a problem, it was easy to eat. The size pieces could be a problem for tiny breed dogs. Not sure if I liked salt in the food. Review: My pugs loved this food, even the very picky eaters. The pieces of the kibble were larger than they are used to buy they had no problem eating it, even the old pugs with hardly any teeth. Obviously it was tasty or they wouldn’t have eaten it. Their stools were normal, there was no soft stools or hard ones. They seemed very satisfied after eating. Con: One dog seems to be very impatient when feeding time. Not really a con on the food just he’s become a little over-enthusiastic about it. Review: This is a really nice food for a variety of dogs. My two older dogs (Min Pins) occasionally suffer from constipation while my younger two (Mini Aussies) have a sensitive digestive system. Since being on Sun Dancer we’ve had no problems either way. This is a relief and a cost saver as vet visits were needed. Review: My three dogs really like Sun Dancer. It seem to satisfy them. They eat their breakfast and dinner and don’t beg or act hungry afterward. Review: We have been using the Sun Dancer Grain-Free Chicken for about 3 weeks and my dog is impressed She had become a bit of a picky eater and when we introduced the sun dancer she cleans her bowl. Review: Our dogs really loved this food. The kibble size is good for small and large dogs alike. I also liked that, when I read through the ingredient list, everything on the list was something I could pronounce. The ingredients are high quality, too, and chicken, chicken meal and whitefish meal are among the first 5 ingredients on the list. This food did not upset our dog’s stomach who suffers from Irritable Bowel Syndrome, either. I would highly recommend this food. 2 Features: Interesting that it has Quinoa and flaxseed! 2 Benefits: My dogs loved it, woofed down their bowls quickly and without hesitation! Review: No poo intended! Seriously, we all have to clean up after our pets and we all dread the yucky poo’s. My pooping pack of four had nice formed poo every time they went while eating this food. No issues with tummy upset either!!! which is amazing because two of the four pooping pups are very sensitive to food changes! My dogs loved it going in, I loved it coming out! 2 Benefits: Much better digestibility & She LOVES it! Review: I have a 7 year old Bernese Mountain dog (Morgan) and she really, really loves the Solid Gold Sun Dancer. Since she’s getting older, I’ve become more selective about what she eats and all I have to say is that Morgan does very well on this food. Her digestibility has improved, she has more energy, her coats shinier, and she just seems much happier. I highly recommend Sun Dancer. It’s grain and gluten-free, 30% protein, no corn, wheat or soy, a prebiotic to help digestibility (FOS), tapioca is the primary form of starch, and lots of quinoa! YUMMY GOODNESS! Review: I like the way Sun Dancer is grain free and gluten free. It works perfectly with my dogs rotation diet. And because it’s high in protein it gives him the energy he needs to run fast at the dog park. I love getting compliments on how fit my dog looks. He gets a clean bill of health at the vet every time. Review: Sun Dancer is my dog’s current favorite. She eats a varied diet including raw and kibble.